The chapter on observed death rates illustrates why demographic rates need to be adjusted by the number of person years lived and shows surface maps of such “raw” death rates for a few selected national populations. One can easily see that random fluctuations can turn out be problematic for smaller populations as they may lead to misinterpretations. with death counts and exposures denoted as D(x, t) and N(x, t), respectively. Hence, mortality is still higher in Germany than in Austria but only by about three per cent and not by an order of magnitude. Death rates at those single ages x, that are used exclusively in this book, are often a good approximation for the continuous force of mortality at the middle of that age μ(x + 0. 5) (Thatcher et al. 1998). 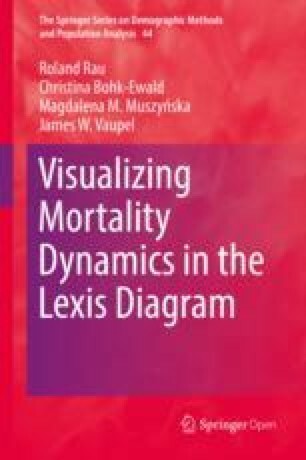 Nearly all of the analyses contained in this volume are based on such death rates. The raw surface plots on the following pages depict the observed death rates for women and men in a few selected countries. Death rates were estimated for single ages and single years from 1950 until the last available year in the Human Mortality Database, in most cases 2014 (see Chap. 3). Our color scheme ranges from blue to green to red. To facilitate interpreting the plots, we added contour lines for various levels of mortality similar to the ones for elevation on topographic maps. The levels of 1 death per 10 person-years lived, per 100 person-years lived, per 1,000 person-years lived, and per 10,000 person-years lived have been printed as bold lines as visual cues not because of any implicit distinct meaning apart from the digit preference. Generally speaking, we do not think that raw surface plots are the best option to visualize mortality dynamics. That is why we only depict a few countries here. One of the main problems is that the observed rates suffer from random fluctuations. At young ages because death rates are so low; at older ages because there are so few people left. Thus, the numerator for the observed death rates is relatively small in the first case whereas the denominator is relatively small in the latter case. What we can observe for Australian women and men in Figs. 4.1 and 4.2 is representative for many countries in the Human Mortality Database1: Most contour lines tend to move upwards over time. This indicates that the same level of mortality is being observed at higher and higher ages. Or, expressed differently, mortality is continuously decreasing at almost any given age. Switzerland and Spain in Figs. 4.3, 4.4, 4.5 and 4.6 are further examples of this general trend. It seems to be noteworthy that the late 1990s seems to be an important era for major improvements in mortality among young males. (not shown here) that have been distinct from the rest of Europe: Irregular trends, especially among males, and even increasing mortality as depicted by the downward contour lines have been rather the rule than the exception between the 1960s and the early 2000s. See Figs. A.3–A.8 in the appendix for corresponding plots for France, England and Wales, and Norway.